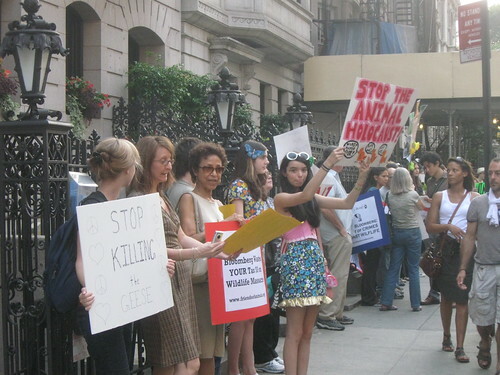 On August 9th, Friends of Animals organized a spirited demo protesting city plans to kill more geese, right across the street from Chez Bloomberg. I went over to check it out, and chatted with some friendly people. 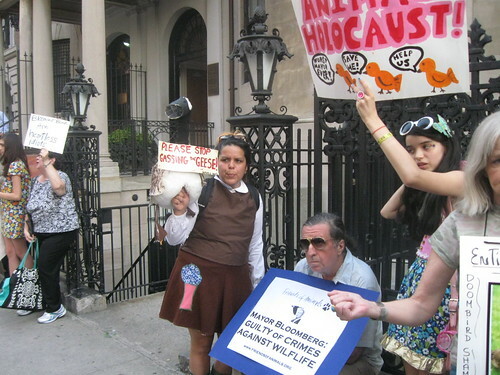 I didn’t actually join the demo because I felt underinformed and a little weird about standing amongst signs decrying the “animal holocaust”. Not that these same thoughts hadn’t already gone through my mind–I mean, they did round up the geese and gas them to death, for god’s sake–but I tend to oppose citing the holocaust for shock value when making an animal rights point. Or any activisty point. I’m glad they were there, though. While you’re at it, the man does deserve a thumbs up (for once) for his support of Park 51. Its worth voicing your support in the face of so much opposition. Next Post Rock the Bells! But my instinct not to post won out. And I think what I had originally written was a little snarkier than that. You totally could have commented! When I first heard about the demo, I was like: “I should go to that!” But then, I thought: “I can’t even find info on who is organizing it, let alone the specifics of what they think should/should not happen.” I think I actually said something to my demo-visiting companion about not wanting to join a demo where people are yelling about the “goose holocaust” and…voila!